“We played some sones, and people were astonished, they made a circle, everybody was dancing, people were asking us, “What is the name of your band? Where do you play? Do you have cards? We didn’t have any answers!,” says Juan Díes, one of the founders of Sones de México Ensemble Chicago. Dies is explaining the origins in 1994 of the beloved Chicago group, twice nominated to the GRAMMY™. In April of that year, he had a concert as a soloist and he had invited friends and colleagues Victor Pichardo and René Cardoza to join him. Shortly after the success of this event, Pichardo came up with the group’s name of “Sones de México Ensemble Chicago”. The current Sones de México lineup includes founders Juan Díes and Gonzalo Córdova plus Lorena Íñiguez, Juan Rivera, Zacbé Pichardo and Jorge Leal, all multi-instrumentalists on a wide range of Mexican folk instruments. 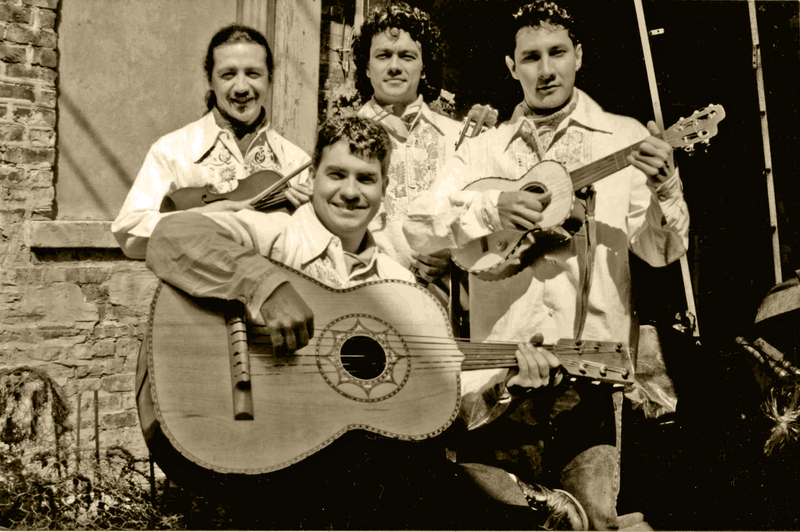 The group has released six records: íQue Florezca! (Let it Bloom) (1996); Fandango on 18th Street (2002); the GRAMMY® and Latin GRAMMY® nominated Esta Tierra Es Tuya (This Land is Your Land) (2007); Fiesta Mexicana (a children’s album) (2010); ¡Viva la Revolución! (2010); and 13 B’ak’tun (2013). Collaborations have always driven new and exciting eras for the band. Says Díes, “One of the things that have made us most creative are real challenges that we have faced. Like we have to develop something, music for a movie, to work with the Symphony, or a special performance celebrating Buck Owens, or a special show with Led Zeppelin music. We are faced with a situation, and we look for a solution, and because of that, something new arises. That’s the way some of the our greatest hits have come about, collaborations with musicians from the Symphony, with Victor Garcia of Latin Jazz, or Old Town School of Folk Music for a Woody Guthrie tribute. Sones de México will be celebrating their anniversary with a musical extravaganza at Millenium Park, and Dies promises that artists representing Chicago’s Irish, blues, jazz and classical music communities are expected as well as Mexican dance companies. Founding member and Musical Director Victor Pichardo is writing the arrangements for the concert. All past members of the group are also expected to perform during the evening, including founding members René Cardoza and Raul Fernández. “It’s like a one-night like class reunion!” exclaims Dies. The concert also marks the beginning of a new phase for Sones de México, which will include new projects with some of the evening’s guests and the founding of a music school dedicated to Mexican music and dance. Sones de México, will celebrate their 20th anniversary with a free concert at Millennium Park’s Jay Pritzker Pavilion on Wednesday, September 3 at 7pm. Check Catalina’s weekly show Beat Latino on Facebook, subscribe via iTunes, and check the playlist or download the podcast from the archives. Airs Friday and Sunday on Vocalo, where Beat Latino is rated #1 as show listened to at least once weekly by listeners!